Continue our Storage solution list, here I give you another storage makeover ideas you can apply in your apartment or a simple rental house. Good luck with your organizing effort and let’s start the countdown. BTW, Go to this link to check out our first storage solution list. Using Velcro on commonly misplaced objects is one of the fastest, cheapest ways to get organized. Never lose your remote control again! Just place a thin strip of Velcro on the back of the remote and the opposite strip on the side of your TV stand for easy and quick storage. Everyone needs at least one junk drawer, but finding anything specific in there can be a tedious task. Wooden laths are cheap at a local hardware store. Use these to build your own compartments in the junk drawer at home. It will take a few nails and some measuring, but this is a quick and simple solution to keep like-objects together and stay organized. The kitchen presents an entire array of stray objects. 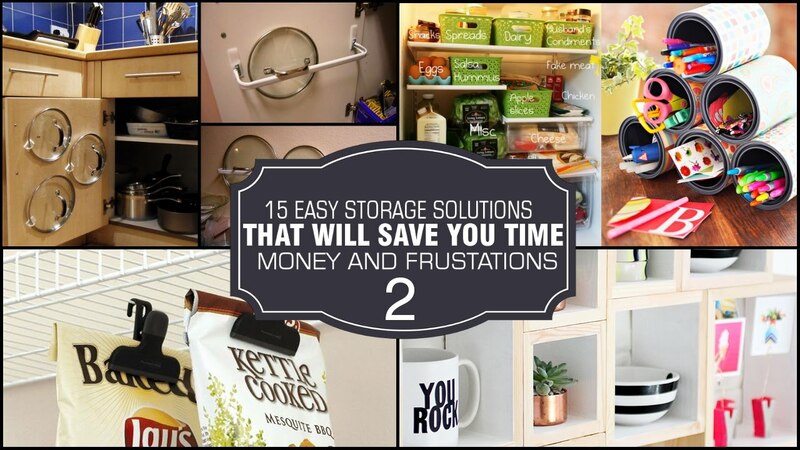 Tired of digging through the snack cabinet to find what you want? Hang your bags of snacks from a wire rack by using sealer clips with hooks. This will help with the empty space above the shelf when you are able to hang each potato chip bag on its individual hook. It will also keep them from getting crushed (unless you like that sort of thing). Is there any way to organize the refrigerator so that the can in the back can be easily and cleanly retrieved? Sure—just put your refrigerated items in bins of like-food. It might take some shopping around to find the right size storage bins to fit in each section of your refrigerator, but it’s a fast and cheap fix. They’ll slide in and out easily, and it makes for easy cleanup if your radishes decide to spoil and liquidize. Just slide your vegetable bin out and clean that one container instead of the entire refrigerator. This perfectly sized Whitmore Supreme Kitchen Baker’s Rack lives up to its name. It fits easily along a wall or along an unused space to store crock pots, large kitchen items, pots and pans, and cutting boards. With an adjustable shelving unit, store the big items down below, use the wood top as a butcher block or veggie cutting station, and hang your pots and pans from the top shelf. This attractive storage unit will not only add to the look of your kitchen, it also saves tons of space. More info . One of the most difficult areas to organize (let alone keep clean) is the children’s play area. Yet it’s all easily organized with this RiverRidge Kids 6 Bin Storage Cabinet. This great looking bin has 6 cubbies with colorful baskets to help kids learn to clean up. It comes in a non-toxic finish, and is a fun addition to the play area. The great thing about the fabric storage baskets is they’re foldable if you’d rather put them out of sight. Even if your kid is extraordinarily neat-freakish, this helpful bin keeps toys organized and out of sight. Find out more information in the description on how to order! So what about the wrapping paper? You’ve probably tried to store it in any object that seems large enough to hold a few rolls. But if you have kids, they usually end up being used as light sabers, right? Find an old plastic garment bag, the kind with a hanger cut out at the top. Then fill the bag with the rolls of wrapping paper, insert the hanger at the top, and hang it inside a closet for easy storage and quick access. Now your Christmas season is not only filled with spirit, but also with rolls of organized wrapping paper! Yard tools can offer a whole new level of frustration in storing them along the garage wall so that you don’t catapult yourself by stepping on the hoe. Try using small cut sections of PVC pipe nailed to a 2×4 board and mounted on the wall at waist height. Put each item through one hole to keep it standing up and in place. Shovel, hoe, rake, and other yard tools fit perfectly down inside the small sections of pipe and are easily removed when you need to use them. Don’t have PVC pipe or the time to assemble a new wall rack? Just use an old palate. If you don’t have one already, ask a local hardware store if they have an extra. By removing the top two or three rows of boards on the palate, you can easily fit rakes and other tools when you stand it up along the garage wall. Leave the bottom of the palate intact to stabilize the utensils. The palate should allow you to store several items side by side. This is a quick and affordable fix for organizing your yard tools. If you’re in the mood to organize your closet, use something as simple as shower curtain hooks to store your purses on. You can easily hang them from a rod, and you can be as creative as you like with the style of hooks! Get bedazzled, rustic, or any other style hooks and hang them individually on your clothes rod in the closet for easy purse access. Additionally, if you have a walk-in closet, be willing to use up wasted space by placing hooks or shelves up high to store your weekend bags or suit cases. This will take a heavier duty hook or shelf, but the end result will be worth it when luggage bags are neatly stowed away instead of lingering on the floor in the corner of the room. Use caution when hanging heavy items, though. Make sure if you’re using a mounted hook that it is securely fastened to the wall. Don’t forget that wasted space overtop of the doorway! Where are your pens, pencils, scissors, and small accessories? Probably in the junk drawer that nobody dares to organize. It doesn’t have to be so intimidating, though. Find a couple old cans—large soup cans or old coffee tins and decorate them how you like. You can even wrap them in a cool material of your choice using hot glue. Store like-objects in each tin along your windowsill or someplace easily accessible. Spices piled high in the kitchen cabinet are more likely to create an avalanche than Mount Everest! Before you get steamrolled with paprika and onion powder, stick them all in a large shower caddy hung conveniently on the inside of a pantry door. If you can find an adjustable shower caddy, it’s even more convenient so you can lower the rack to the perfect height. Just find one that works for you, and your spices will be easy to grab while cooking. Dinner will be much quicker if you can find the right lid to the pot you’re using without tearing down the kitchen. The lid you need is always at the bottom of the pans. For a quick fix, plastic adhesive hooks can be placed strategically on the inside of kitchen cabinet doors to the right size for your pot lids. When you’re done with a lid, just stick it inside the plastic hooks and you’ll always know exactly where to find each lid—plus it’s out of the way. What to do with great grandma’s ancient piece of pottery, or Aunt Suzie’s cross-stitched tissue box is the ultimate dilemma. Sometimes you just have to hang on to the family pieces, but finding the right spot for them can be tricky. Box shelves are one of the most trendy and easy solutions to storing valuables up high. Whether you get them at the store or you build them yourself, box shelves can take any shape or form. If you’re particularly gifted, you can even make a corner box shelf. It makes the perfect spot to stick that awkward vase, and you can store things inside the box or on top of the box- or both!